During the growing season, you'll find a stunning selection of robust native plants for sale in our Garden Shops. Our plants start from seed that our staff and volunteers harvest sustainably in the wild throughout the region. From the first sprout in an ice-cube-size cell to the ground-ready specimen rooted in its own pot, we raise our plants organically, without pesticides or chemical fertilizers, so they will delight your eye and support the birds and bees that keep the rest of life humming. Whether you are a homeowner or a landscape pro, we have the expertise to help you choose individual plants for a wide variety of conditions. We also offer curated plant collections and kits for particular purposes and conditions (see the green boxes below), as well as useful books, tools, garden ornaments, and home accessories. And whatever you buy from us comes with a feel-good bonus: Proceeds from the shop sales help support our mission. Even off-season, you can plan your garden anytime with our lists of plants and prices (see red buttons, below), as well as the Garden Plant Finder in the top menu. Q: I'm new at gardening with native plants. Where can I get some advice about which plants will work best in my yard? Q: I'm a landscape designer looking for a price quote on a big order of plants. Who should I talk to? A: Call or email our retail manager at Garden in the Woods: 508-877-7630 x3209; gardennatives@NativePlantTrust.org. Q: Can I place a pre-season order for plants before your Garden Shops open in April? A: Yes. Usually, we know by February which plants will be available for the upcoming growing season and post an updated Plant Availability List on our website. To place a pre-season order using your credit card, call our retail manager at Garden in the Woods: 508-877-7630 x3209. (Please do not email credit card information.) At that time we can discuss whether you'll pick up your plants at Garden in the Woods or Nasami Farm. Q: Can I order a gift card over the phone? A: Sure. We'll even mail it for you! A: Not yet, but it's coming! Until then, we are happy to take your calls and respond to your emails during our Garden Shop business hours. Thanks for your patience. Transform your home landscape into a pollinator oasis that buzzes with life! Note that our Pollinator Kits must be ordered in advance. Please order ASAP—see instructions below—as supplies are limited! Each kit contains 50 wildflowers (7 species), packaged in a single tray and selected to produce both a cascade of bloom throughout the season and habitat for specific pollinators at all stages of their life cycles. Contained in 5-inch deep plug cells, these plants should mature to fill a space approximately 10 x 12 feet or larger, depending on what is growing there already and the desired planting density. The species in each kit are listed in our info sheet. Our plug kits deliver faster results than planting from seed, because you start with well-developed plants with deep, healthy root systems that establish quickly. We feed our plants with organic fertilizer and use biological controls rather than chemicals as our first line of defense against pests. We use no systemic pesticides, such as neonicotinoids. Price: Each kit packs super value at $180. Members save 10 percent! Supplies are limited. Order now for pick-up in late June or July! Full payment is due when you order. Please do not send credit card information in an email. Even small landscapes have varied conditions and planting needs. That's why we created our nine native plant collections. Each of our collections contains eight plants and will be available for pick-up at Garden in the Woods or Nasami Farm. Herbaceous plants come in 2-quart or 1-gallon containers. (Exception: Some plants in the Spring Ephemerals Collection come in 3-inch pots.) Shrubs and vines are in 2-gallon containers. Order your collection in winter or spring for pick up at Garden in the Woods or Nasami Farm during the growing season. 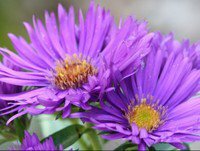 To order, contact our retail manager with payment information, the name of the collection(s), quantity, and pick-up location: 508-877-7630 x3209; gardennatives@NativePlantTrust.org. From bee magnets like Helianthus divaricatus to the hummingbird moth’s preferred Monarda fistulosa, these plants are sure to have your garden buzzing! Want to devote a large area to pollinator plants? Check out our Pollinator Kits, in the green box above. Focused on New England’s fabulous array of spring ephemerals, this collection contains species that are among the first to bloom in early spring and usually go dormant by midsummer, as the rest of the garden comes alive. Does your garden have a wet spot where the grass won’t grow and the mower gets stuck? The plants in this collection will beautifully fill wet areas of your garden. When the spring ephemerals have passed, the plants in this collection take the spotlight, keeping your garden in glorious bloom—and nourishing the pollinators!—during backyard barbecue season. these plants will be in or approaching full bloom June through September. The backbone of your garden, shrubs add structure, height, and varied habitat. Included are nine of the best native species, most grown from locally harvested seed at our Nasami Farm nursery. Tired of looking at that barren strip between the sidewalk and the road? How about filling it with natives? This collection includes some of the most drought-, salt-, and compaction-tolerant plants the native flora has to offer. From Asclepias to Pycnanthemum, these plants will make your roadside look like wild garden.. This collection of salt-tolerant, pollinator-loving natives will fill the bill for those with houses on the Cape and elsewhere near the shore. Combines well with the Roadside Collection for a super group of plants that thrive in harsh, sandy conditions. Are you looking for plants that do well in shade or at woodland edges for color throughout the growing season? Here is a collection for you. Often, what’s underneath is as important as the standout. Whether a true ground cover or an important fill-in shrub, this collection is sure to add woodland interest. 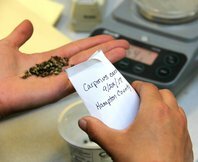 We're racing to bank the seeds of New England's 388 rare plants by 2020. Help us fill the Seed Ark! 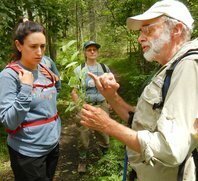 Whether you want to learn more about native plant garden design or the ecology of a bog, we've got classes for you!